There is only one maintained route to the Colorado River from the North Rim of the Grand Canyon, though at 14 miles (one-way) and with a descent of nearly 6,000 feet, the North Kaibab Trail is not for everyone. The other rim to river routes (Nankoweap, North Bass) are even more strenuous, and just reaching the trailheads is difficult. But in contrast to the South Rim, there are a variety of easier, mostly level paths that follow the rim and lead to tranquil viewpoints, well away from the main visitor center complex at busy Bright Angel Point. Because of the high elevation of the area (8,000 feet or more), these paths are pleasant even in midsummer; the only downside is the short opening season of the North Rim, from May to October. 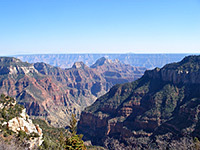 The Grand Canyon National Park map indicates the location of the central trails. Countdown of the top 20 trails. 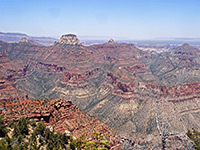 Bright Angel Point 0.4 100 Starting beside the historic Bright Angel Lodge, a paved trail descends a short distance to the southern tip of a narrow promontory for excellent views over the Grand Canyon, from The Transept in the west to Bright Angel Canyon in the east. Every visitor to the north rim walks the path at least once. Cape Final 2 150 A long disused vehicle track provides an easy route across the edge of the Walhalla Plateau to the easternmost viewpoint on the North Rim, 7,916 foot Cape Final, which overlooks a vast area of lesser-known formations centered around Chuar Valley and Unkar Creek. The trail begins 2.5 miles before the end of the paved the road to Cape Royal. Cape Royal 0.3 40 Competing with Cape Final to be the best North Rim viewpoint, Cape Royal is reached by an easy, paved, wheelchair-accessible footpath starting right at the end of the paved side road across the Walhalla Plateau. En route is Angels Window, an oft-photographed natural arch in the Kaibab limestone. Clear Creek 9.4 1,500 0.3 miles from Phantom Ranch up the North Kaibab Trail, another path forks off to the east, climbing the canyon side via a series of switchbacks, up to the Tonto bench, which it follows for nearly 10 miles further east, around several small ravines and into the larger drainage of Clear Creek. The official trail ends here though continuation hikes are possible either down Clear Creek to the Colorado River (6 miles), or up the canyon to 800 foot high Cheyava Falls (5 miles), though this only flows in springtime. 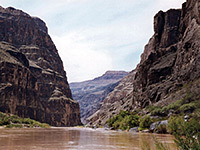 At least two nights camping are needed to visit the Clear Creek area, with the usual entry route being the South Kaibab Trail. Cliff Spring 0.5 150 This short path descends a wooded ravine, past a small Anasazi ruin and along the side of a deepening canyon to an elongated dripping spring, where water seeps from the rocks above and supports hanging gardens of ferns and moss. The trailhead is along the main road half a mile before Cape Royal. Ken Patrick 10 600 Named after a ranger who worked at the national park in the 1960s, but was later killed whilst on duty at Point Reyes National Seashore in California, the Ken Patrick Trail links the start of the North Kaibab Trail with Point Imperial, running mostly across the forested plateau but with many viewpoints over the rim - either of upper Bright Angel Canyon or the larger Grand Canyon around Nankoweap Creek. The west end is the most used (and also traveled by mules), as far as the turn off for the Uncle Jim Trail; the next section to the junction with the Old Kaibab Trail is still easy to follow, while the final part is rather less well defined. A car shuttle is normally required if hiking the full distance. Nankoweap 14 6,000 Nankoweap is a long route from the Kaibab Plateau to the Colorado River, starting from the end of forest road 610, 12 miles from the north rim entrance road. The trail is unmaintained, little used, and very strenuous; the full round trip needs at least two days and the trip involves the greatest elevation change of any trail in the Grand Canyon. An alternative trailhead is found a little way north, accessed via a longer track across House Rock Valley starting at US 89, and can be used some of time when the north rim road is closed for the winter. Summer hikes on the Nankoweap Trail are not recommended owing to the exposure, heat and lack of water. North Bass 14 5,300 Constructed in the 1890s by Grand Canyon pioneer William Bass, this very rough and remote trail leads down Muav Canyon, White Creek and Shinumo Creek to the Colorado River. The starting point is Swamp Point, itself quite difficult to reach, requiring a 17 mile drive over logging tracks, starting from AZ 67 close to North Rim Village. An alternative approach is via Ryan Road from Fredonia - a longer route but one accessible for more of the year. At least one night camping along the trail is needed if hiking the full distance; more if exploring other areas such as Powell Plateau, reached by a branch of the trail to the west. North Kaibab 14 5,780 The relatively popular North Kaibab Trail is a well used route down Bright Angel Canyon to Phantom Ranch and the Colorado River - the only maintained route to the river from the North Rim. For a day hike, one good target is Roaring Springs after 5 miles, while for those making the full trip, the Cottonwood Campground after 7 miles is a good place to break the journey. Water is available at several places en route, though the distance and elevation change still make the journey a difficult undertaking. The 3 mile section to Supai Tunnel is also used by mules. Old Kaibab 7 3,700 Also known as the Old Bright Angel Trail, this path formed part of the route along Bright Angel Canyon prior to construction of the steep upper section of the North Kaibab Trail in the 1920s. Although not maintained the path is still easy enough to follow, and can be used to make an interesting loop hike; the start point is 4 miles along the Ken Patrick Trail, from where the path heads south and descends rather overgrown slopes around the upper end of Bright Angel Canyon, then follows the creek mostly a little way above the streambed to the junction with the North Kaibab Trail, near Roaring Springs. The loop is completed by turning right here and making the tiring climb back to the trailhead, a total distance of 16 miles. level From the end of the paved road to the highest overlook on the North Rim, 8,803 foot Point Imperial, this easy, level trail follows an old track (closed to private vehicles) northwards to the park boundary, where it meets the end of forest road 610, and the start of the Nankoweap Trail. Most of the 2 mile route is close to the plateau edge, and has fine views over upper Nankoweap Creek. Transept 1.5 150 The Transept is a deep, sheer walled tributary of Bright Angel Canyon, on the west side of Bright Angel Point. A short trail follows the rim between the North Rim campground and Bright Angel Lodge, staying right by the edge apart from where it bends inwards to curve around several small ravines. The path is always quite busy owing to the large number of people visiting this area. A 3 mile loop hike is possible via the Bridle Trail, which parallels the main road and links the same two points, continuing a little way beyond to the North Kaibab trailhead. Uncle Jim 5 (loop) 100 This loop trail across the forested plateau leads to a viewpoint on the rim that overlooks Roaring Springs Canyon, some of Bright Angel Canyon and the upper part of the North Kaibab Trail. 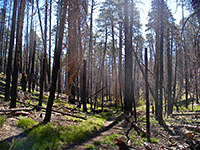 The trailhead for both paths is along the main road 2 miles north of Grand Canyon Lodge. Widforss 5 400 Start point for the Widforss Trail is a short distance along a side road that forks west one mile before the North Rim visitor complex. 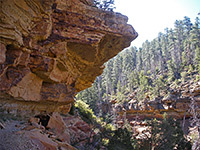 The trail has two distinct parts; the first few miles stay close to the canyon rim and pass many viewpoints into the depths of The Transept, then the path moves away into the forest, ending at a much more far-reaching viewpoint where many miles of the main Colorado gorge can be seen. Lava Falls 1.5 2,540 The Lava Falls Trail offers an extremely steep, difficult hike across loose scree and lava blocks, from the rim to the Colorado River. But the route is quite short, and makes an excellent half day hike. The trailhead is located at the end of a rather rough 2 mile track branching off the road to Toroweap overlook - and about 60 miles from a paved highway, along the Mnt Trumbull loop road. level The Tuckup Trail is similar to the Tonto Trail on the South Rim but less traveled; it follows the mostly flat Esplanade sandstone layer from Toroweap Point eastwards to 150 Mile Canyon, curving around numerous side ravines of which the largest is Tuckup Canyon. There are various options for hiking just certain sections, and for descending towards the river. The east end may be reached from a 4WD track across Kanab Plateau.